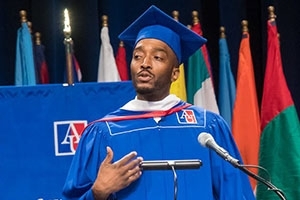 Kofi Gayle-Tendai, one of two 2018 American University School of Communication (AU SOC) student commencement speakers, is a Washington D.C. native who has always had an interest in entertaining. Since youth he's used both music and video to express himself, as well as his view of the world. After spending some time on the local art scene making a name for himself as a musician and videographer, he decided to finish his degree, graduating from Howard University in 2015 with a BA in Radio Television and Film, then continued on to AU SOC that fall to begin work towards an MFA in Film & Electronic Media. He is currently completing his Capstone project, a narrative short about the dangers of using violence to solve problems. Professionally, he is already establishing himself. Gayle-Tendai has had one of his short film assignments selected for a festival, and he has started a production company Born on Friday and has done work for the U.S. Office of Housing and Urban Development, DCTV, Fox 5 and NBC 4 to name few. After commencement, he will join 19 other students traveling to L.A. as part of SOC’s competitive L.A. Intensive program, which takes recent alums with a focus in the field of entertainment including television and film to California to meet alumni and industry professionals through site visits, meetings, panel discussions and social events. He plans to move to L.A. and hopes to direct feature films.